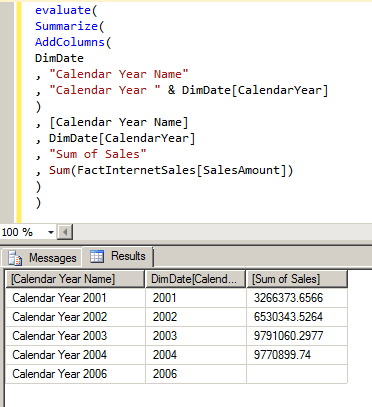 In this case the two parameters for Crossjoin() return a table of distinct values from DimDate[CalendarYear] and DimDate[FiscalYear], and the table returned gives every combination of values from those two tables. 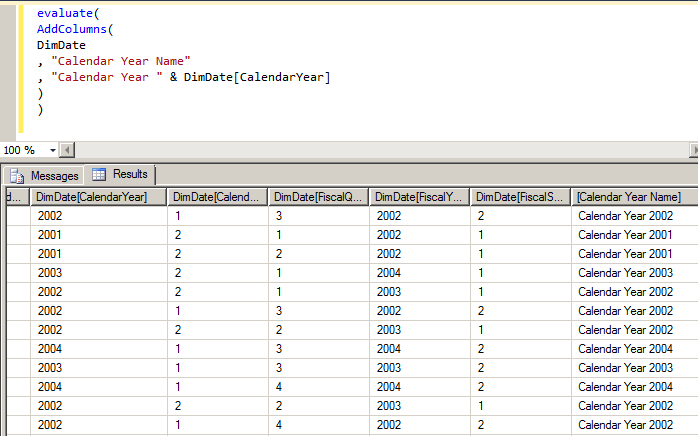 From an MDX point of view, it’s interesting to note that we really do get every single combination: there’s no auto-exists being applied, and we get combinations like CalendarYear 2001 and FiscalYear 2004 that do not exist in the DimDate table (I have no problem with this – it’s what I’d expect to happen in DAX). 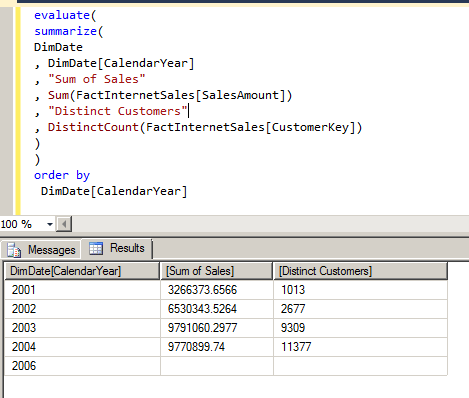 Notice how, in the first query, you get one row for every distinct combination of Year and Category whether there are any sales or not, whereas in the second query you only see the combinations where sales exist. In part 5, I’ll look at how to use the Generate() and TopN() functions. It’s been clear for a while now that Sharepoint is at the heart of Microsoft’s BI strategy. The first sign was the way PerformancePoint was touted as a replacement for Proclarity. Then came the news that if you wanted to share models between multiple users in PowerPivot, you needed Sharepoint 2010 Enterprise Edition. In Denali, if you want to use cool new stuff like Crescent or the new SSRS alerting functionality you need Sharepoint. But is this a good thing for Microsoft BI? Behind the scenes a lot of people have been debating this question for a long time, so I thought it was an appropriate subject for a blog post – and you know how I like controversial topics…! Let me start by saying that I have I have an opinion on this but not one that I feel 100% sure of asserting: I have the nagging feeling that my own view of the market is too limited to know whether the Sharepoint strategy is good or not, so my mind isn’t completely made up (and in fact the more I think about this issue, the more unsure about my opinion I am). Also, I don’t think anyone has objections to the purely technical reasons for the Sharepoint strategy – after all, why should the various Microsoft BI teams be in the business of building portals when Microsoft has its own, extremely successful portal they can integrate with, which gives them a lot of rich functionality for free? The question is essentially a commercial one: will more customers buy Microsoft BI as a result of increased integration with Sharepoint (in turn leading to Microsoft and its partners making more money, which is all anyone really cares about), or will a Sharepoint dependency actually put customers off and drive them into the arms of Microsoft’s competitors? Microsoft’s BI products need portal functionality. Time and money for development of BI products is limited, so if the portal functionality can be got from Sharepoint then it can be delivered quicker, at a lower cost, and with time and money left over for other new functionality that would not be possible otherwise. More and better functionality means the customer is more likely to buy. Integrating with Sharepoint also gives the wider Microsoft BI offering a coherence it wouldn’t otherwise have (and something it has historically lacked), and the whole ends up being greater than its constituent parts. This lack of overlapping functionality looks good in front of the customer, and also increases the opportunity to cross-sell BI to existing Sharepoint customers and vice versa. Sharepoint is massively successful, one of Microsoft’s leading server products, so most customers you want to sell BI to will have Sharepoint anyway; therefore there will be little resistance to buying new tools that have a dependency on Sharepoint. The Sharepoint market is so large that even if only a small percentage of it is interested in or able to use MS BI, that’s still a massive potential market. Presumably, at some point there will be a fully-featured “Sharepoint in the cloud” with all the BI features baked in, which means that it will be even easier for companies to adopt it. Microsoft is well aware of the arguments against Sharepoint that are listed below, and because it wants the Sharepoint strategy to work it is taking action to address these problems of cost, complexity and uptake. One example is the increasing number of Microsoft BI appliances that are available, where all of the tough configuration decisions are made for you. Sharepoint is expensive (or at least perceived as expensive) in terms of license costs, infrastructure and administration, so it makes the overall MS BI solution more expensive to have a dependency on it. Sharepoint is a complex product (or at least perceived as complex), and Microsoft’s BI tools are pretty complex as well; integrating the two makes something even more complex. As a result, whereas in the past a single BI guy could just install SSAS, SSRS and so on on a server, now you need a BI guy and a Sharepoint guy to do all the setup and admin, which doubles the cost of labour; the added complexity also makes it more likely that the setup and admin will take longer. Microsoft BI products have traditionally seen a lot of their adoption come from internal IT departments taking the ‘it’s effectively free, so let’s install it somewhere and see what it does’ path, and this will become much less common because of the added overhead of Sharepoint. The added dependencies between Sharepoint and BI could actually make it slower to deliver new features because now there are multiple MS dev teams that need to work together, co-ordinate functionality and release cycles, and deal with conflicting priorities. History has shown that MS dev teams don’t always do this well (think of Excel and SSAS support), and even when they do some compromises are inevitable. Many customers do have Sharepoint, but not all of them have the editions or versions that the MS BI stack requires. And very often due to political divisions, an internal corporate Sharepoint team have their own agenda to follow which has no place for BI, and aren’t interested in upgrading to a certain version or otherwise accommodating the BI team when it might impact on their own goals. Some customers do not have Sharepoint and have made a conscious decision not to have it; these customers include not only the die-hard anything-but-Microsoft shops but also some who would be interested in a solution with fewer dependencies. For these customers, a Sharepoint dependency removes all question of the use of MS BI. The MS partner ecosystem, at least at the mid-level, is segregated into BI partners and Sharepoint partners, and while there’s a certain amount of convergence you still tend to find that many consulting companies are BI partners who do a bit of Sharepoint on the side or Sharepoint partners who do a bit of BI on the side, so not all of them are capable of selling or implementing an overarching BI-Sharepoint solution. The nature of my work means that I get to see a lot of different Microsoft BI implementations, probably more than the average consultant. I reckon I work with around 30-40 different customers every year, ranging in size from one-man-bands to the biggest enterprises, and in the five or so years I’ve been in business I’ve only ever seen a relatively small number who actively use Sharepoint in combination with the rest of the Microsoft BI stack. If you work for a large partner that specialises in and actively sells Microsoft BI and Sharepoint you may have seen much greater use of Sharepoint than I have, and if you work for a specialist Sharepoint partner I dare say you only ever work with customers who are very committed to Sharepoint, so I’ll admit my point of view is biased. On the other hand I can’t deny the evidence of my own experience and as a result my natural inclination is to be slightly sceptical about the Sharepoint BI strategy, because I don’t see any basis for the claims that Sharepoint is a ubiquitous platform and one that users actively want to integrate with BI. I’d also add that a couple of years ago I was equally sceptical about Excel’s central role in the Microsoft’s SSAS and wider BI strategy, but now I see Excel used successfully on a wide range of SSAS projects and I’m very much more pro-Excel (although I’m not blind to Excel’s continuing shortcomings as an SSAS client tool for more advanced users). Maybe in a year or two’s time all my customers really will have Sharepoint, the Sharepoint strategy will bear fruit, and my fears will have been proved groundless. 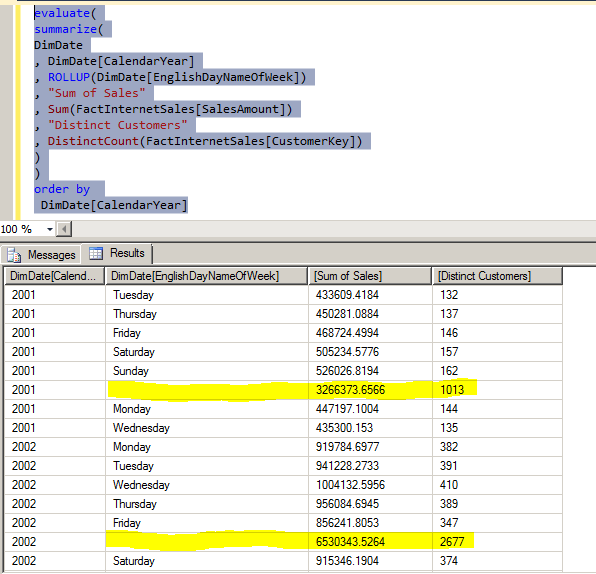 Here I’m adding a new column (shown on the far right in the resultset in the above screenshot) called Calendar Year Name that does a simple concatenation of the string “Calendar Year” with the actual Calendar Year value from the table. You can add multiple columns in this way with more than one column name/expression pair. …gives results you may not be expecting: instead of getting the sum for each year, you get the sum for all years repeated; I’m told this scenario may be changed to throw an error at RTM. 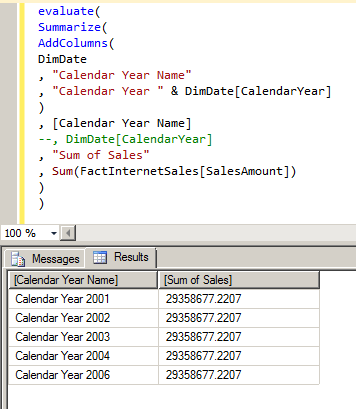 AddColumns() should only be used for formatting a resultset. In part 4, I’ll take a look at the Crossjoin() function. Highlights include the ability to see how long each command in your MDX Script takes to execute (useful when you’re trying to work out why your MDX Script takes a long time to execute – usually expensive named sets are the problem); more detail on SSAS locks; and the new Resource Usage class. 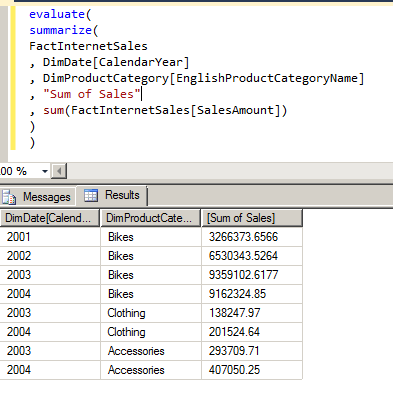 Following on from my last post, let’s now see how we can do group-by style in DAX queries. 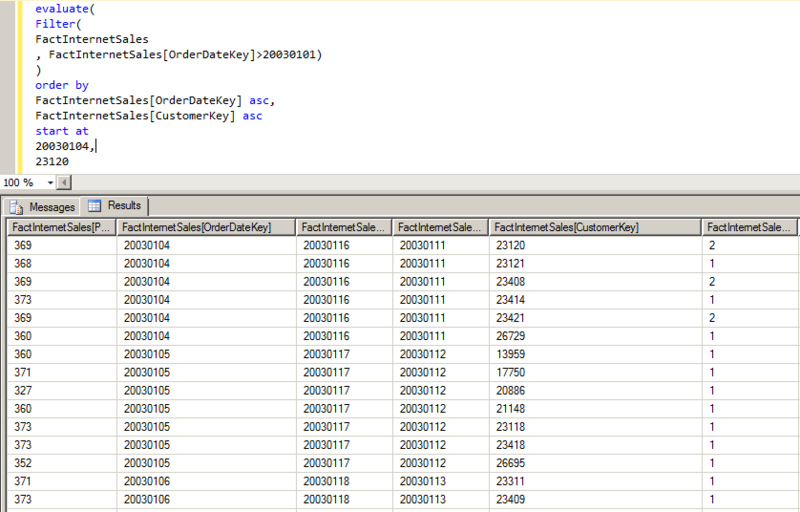 Gives us the sum of the SalesAmount column and the number of distinct values in CustomerKey, for each distinct OrderDateKey value, as extra columns in the resultset. 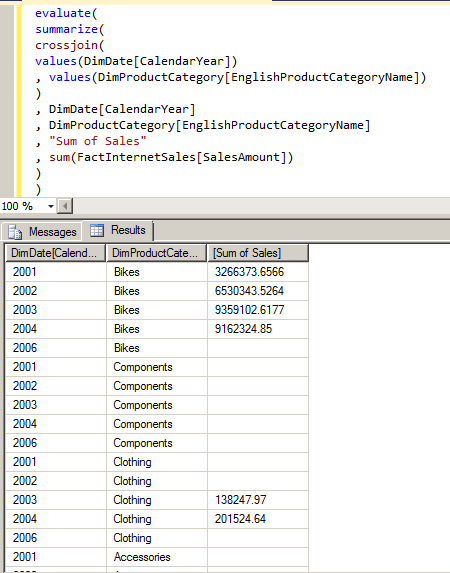 In part 3, I’ll take a look at how to add derived columns. 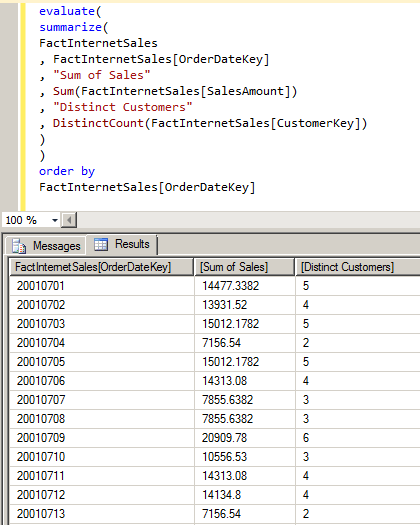 For the purposes of this post and the others in this series I built a very simple Tabular mode with two tables from the Adventure Works database, DimDate, DimProduct, DimProductSubCategory, DimProductCategory and FactInternetSales. 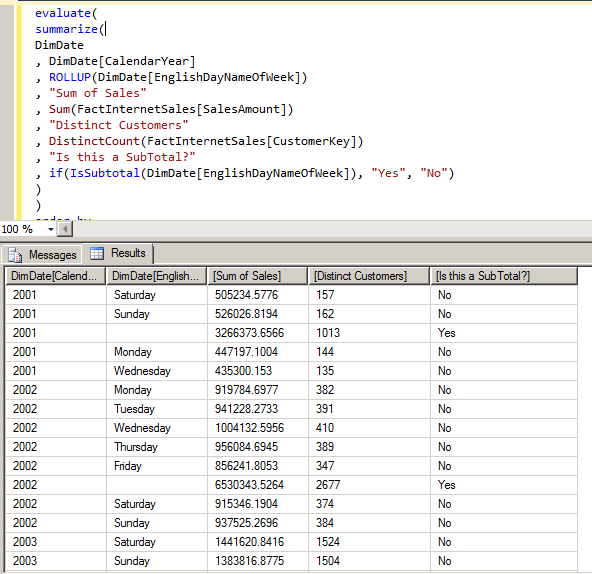 As you can see, the Evaluate statement is at the heart of the new DAX query language: it returns the results of a DAX table expression as the results of a query. 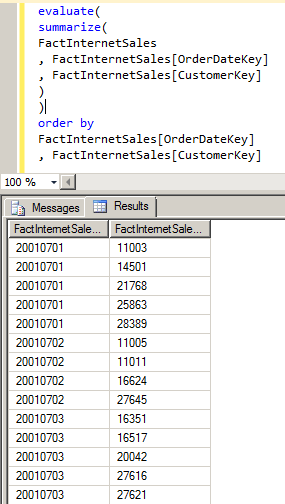 Here, I’m getting all the columns from FactInternetSales but only those rows where the OrderDateKey is greater than 20030101. 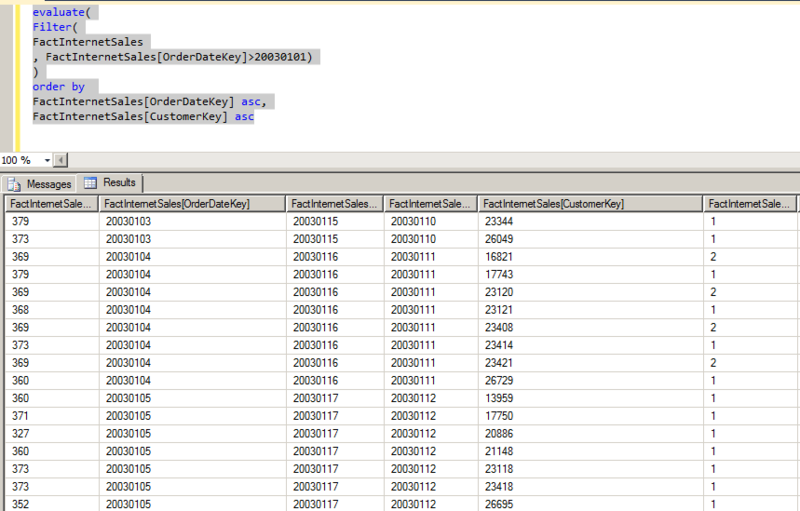 …you can see that our resultset now starts at the row where OrderDateKey = 20030104 and CustomerKey=23120. Registration for SQLBits 9 opened today, although judging by the number of automatically generated emails in my inbox this evening this isn’t news to lots of you. While the options for the training day are available here, we haven’t yet published the agenda for the Friday or Saturday but if you look at the sessions that have been submitted you’ll see that we’ve got a great selection to choose from and you can be sure that we’ll have an extremely strong line-up. It’s particularly encouraging to see so many people registering from outside the UK. SQLBits is already the second-largest SQL Server conference in the world, but we know there’s a massive untapped potential market in Europe of SQL Server people and it could get even bigger. So if you’re reading this in France, Germany, the Netherlands, Belgium, Switzerland, or Scandinavia, why not come over? You’ll have a lot of fun and who knows, you might even learn something useful!